Even in the midst of Winter there are signs of life on the allotment. The new raspberry canes I planted in Autumn are showing some new shoots. Rhubarb is also daring to poke its head above the soil. I must give this patch a couple of inches of compost to feed it for next year. I still have the old mound that I created for my giant pumpkin last year. I will fork it all over and make a mound on my rhubarb. And meanwhile in the greenhouse, quite a few of my Bishop's Kiss chillis are still hanging on in there while the plants have died back. A welcome flash of colour at a dull time of year. The Fieldfare (Turdus pilaris) is a common Winter visitor nearly as big as a mistle thrush about 10 inches long. It is generally distributed in open wooded country from the outskirts of towns. They feed together in the fields, landing first in a hedge and working outwards. They take grubs and worms, and clean the berries from hawthorns and other bushes. In hard weather they suffer severely. In deep Winter they move to suburban gardens and feed on berries and fallen apples. And obviously crab apples too! Also seen here running a few steps over the snow and stopping to dig down with their beaks, especially under my Bramley Apple tree. I must remember not to be so tidy next year, leave fallen apples in a pile for the birds in Winter. This might make a Christmas card for next year! A mob of hungry visitors visited my garden this morning. About 30 Fieldfares descended in a flock and just gorged themselves on my crab apples. Last Winter I decided to leave the crab apples for the birds and not to make myself a few jars of jelly. Two fieldfares visited last year. I suppose this life saving food source location was lodged in their bird brains somewhere and they brought their family and friends back with them a year later! By the way.. this is Matron's first video posting! 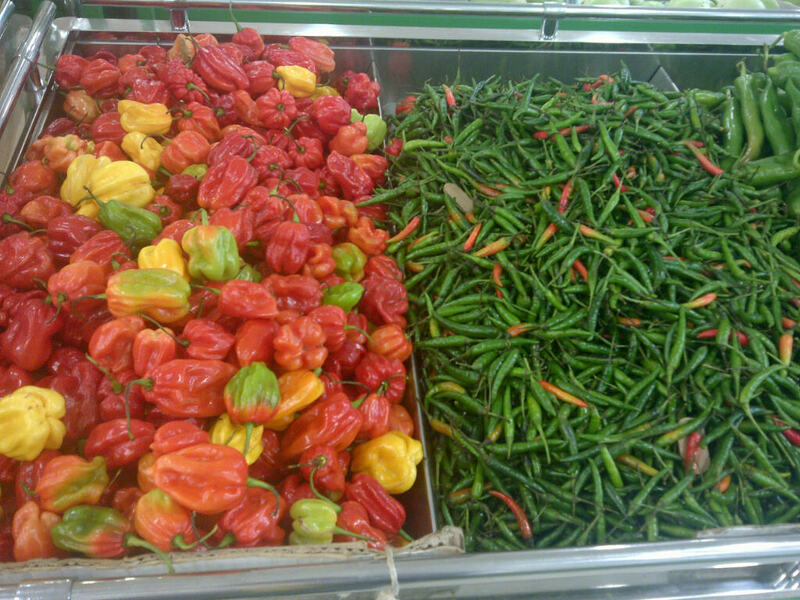 On a freezing January day when the temperatures are below freezing I suddenly had the urge to go shopping for something fresh, spicy and full of vitamins. So I drove to my favourite Asian supermarket in Southall and did some shopping for a selection of ingredients to brighten up an otherwise dull weekend indoors. 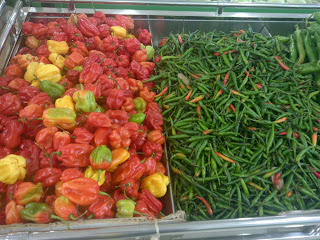 Don't these Scotch bonnet chillis look amazing? Hot enough to open up your sinuses if they happen to be blocked! And a fellow blogger was asking me recently where I obtained my fresh Turmeric root in order to grow some in my greenhouse. Well here you are. 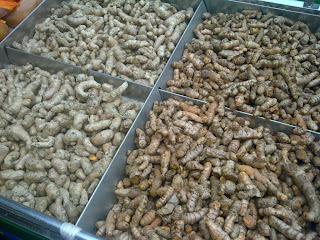 There are actually two different types of Turmeric here. 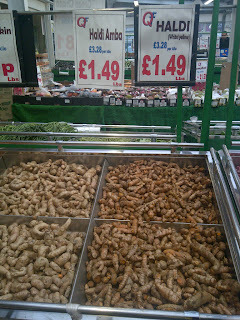 The white turmeric on the left, and the more familiar yellow turmeric on the right. Click on the photo to enlarge the picture and you can see clearly that it is related to ginger. 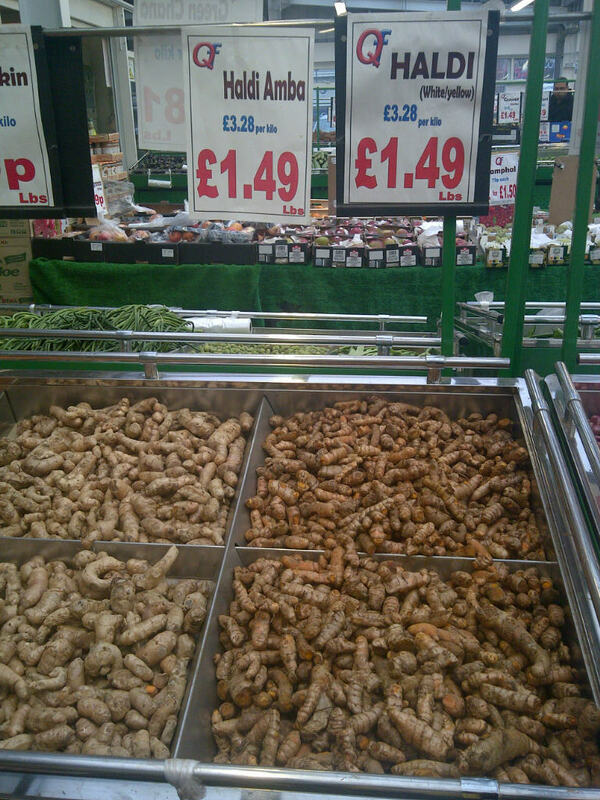 I have only just begun to read and learn about the claimed health benefits of turmeric. I have refined the art of making pickled onions over a number of years of trial and error. Strictly speaking, these are shallots but make for a tasty alternative nonetheless. Peel the onions and shake salt over them so that each onion is in contact with salt. Cover the bowl with cling film and leave them to salt for 24 hours. This draws out some of the moisture from the onions. I find that when you pickle them in vinegar, the vinegar is drawn back into the onion to replace the lost water which preserves it. This makes for a really crunchy onion which is never soft. Quickly rinse the onion under some water and leave on a tea towel to drain and dry completely. Pack the onions into warmed sterilized jars and decorate with a bayleaf and dried chilli if you like. These were some of my Bishop's Kiss chillis from last year! Now this is the key to the whole recipe.. the vinegar. I use a proportion of 3 parts malt vinegar to 1 part water. There is nothing nastier than pickled onions made with plain vinegar, they are horrid! So if you are using one pint of vinegar, add one ounce of sugar. This will NOT make the onions sweet in any way, it brings out the flavour and stops the vinegar being too acidic to taste. Add some pickling spice to this and just bring it to the boil. Allow the spices to steep for a few minutes and take off the boil. Very slowly (so as not to crack the glass) pour the hot, spiced vinegar over the onions right to the top of the jar. I leave some of the pickling spice in the jar for flavour but you can drain it out if you want. Wiggle the jars to allow any bubbles to rise and seal the jars immediately while it is still hot. When it cools the hot air will shrink in size and create a vacuum seal. They should be ready to eat in a month or so. This process was thoroughly supervised by my lovely kitchen assistant! Last Spring I planted a few fresh turmeric roots in a pot in the greenhouse and I was pleased that they grew into this attractive looking plant. So now in the depths of Winter inside the greenhouse I was curious to see what was underneath the plant. It will survive quite well if protected from the frost and kept cool and dry. So there were plenty of roots down to the bottom of the pot. and many of the roots had fattened up into these thicker roots. Quite brittle and easy to snap off I took a few of these turmeric roots indoors. I separated and re-potted the other plants so they will grow away in the Spring. Meanwhile back indoors (and wearing gloves to protect from the staining) I peeled and chopped these three little Turmeric roots. Added a spoonful of honey and ground them in a pestle and mortar into a paste. Optional ingredients that can also be added here are ground black pepper and fresh ginger root. 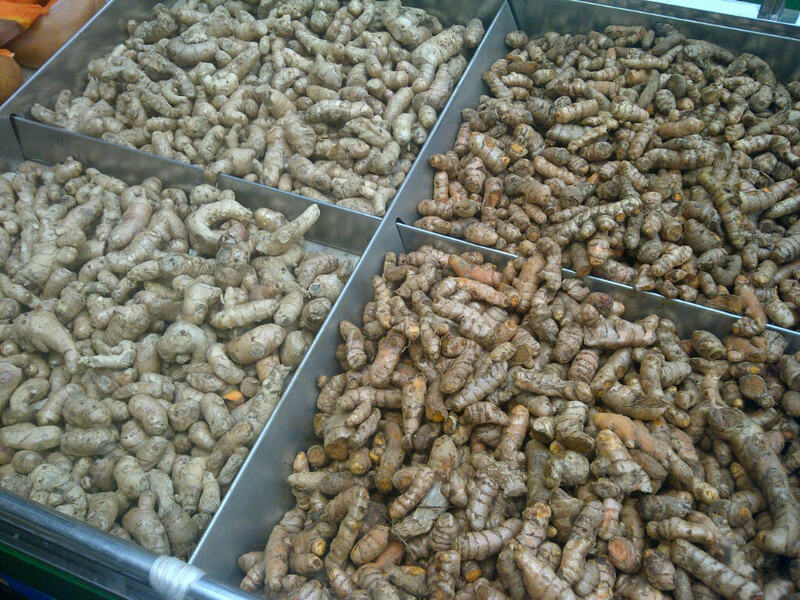 Turmeric has been used for centuries as a powerful medicine. It contains anti-inflammatory properties and is used for the relief of joint pain and arthritis. Just added a cupful of hot milk and some hot tea from the teapot.. and hey presto! A lovely, soothing, warming Winter drink.